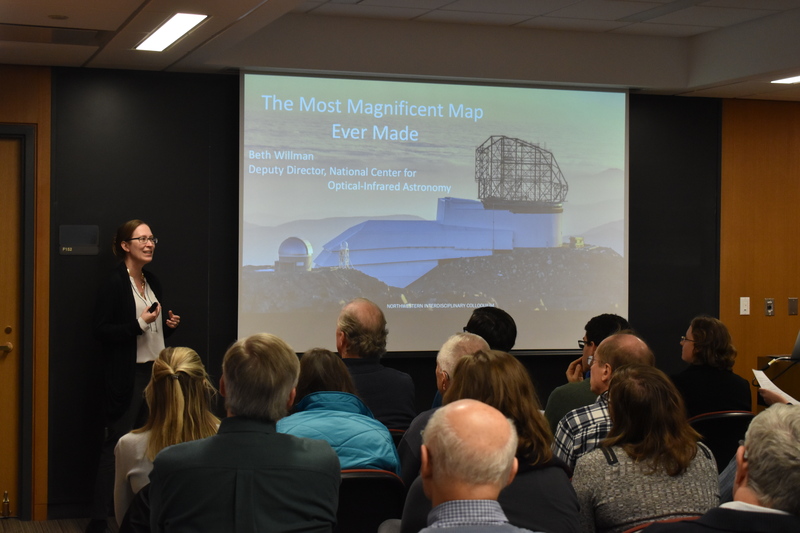 Dr. Beth Willman, Deputy Director of the National Center for Optical-Infrared Astronomy, continued CIERA’s Interdisciplinary Colloquia series this November in presenting her talk, The Most Magnificent Map Ever Made. 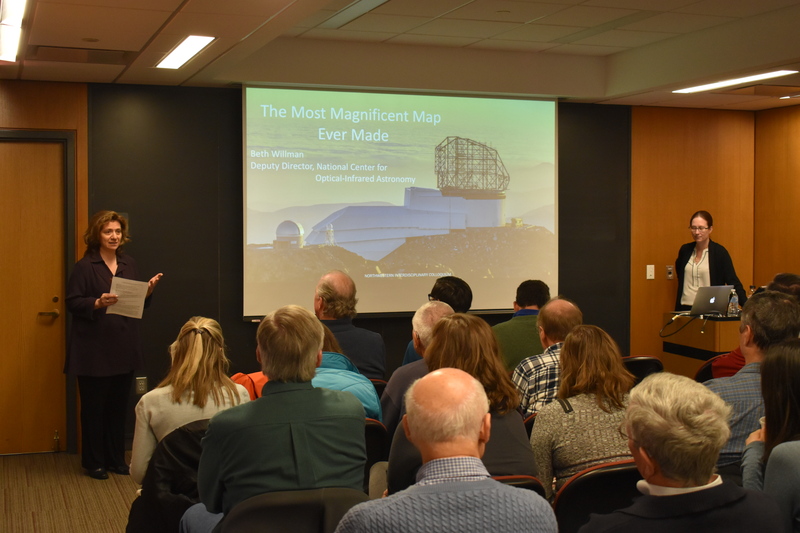 Hosted by CIERA director, Vicky Kalogera, over 85 people of all backgrounds attended Dr. Willman’s talk regarding the mission of the Large Synoptic Survey Telescope (LSST) November 2. In 2022, the LSST will undertake the creation of an 800-frame video of half of the sky in six optical banpasses over the course of a decade. The survey was designed around four key pillars of science: to explore the transient and variable optical sky, map the Milky Way and its surroundings, take an inventory of our Solar System, and investigate the nature of dark matter and dark energy. The LSST will prove incredibly valuable in making new discoveries of an enormous amount and variety of celestial objects, including Near Earth Objects, distant supernovae, and extremely faint galaxies. Dr. Willman discussed the progress being made towards first-light and potential roles for the LSST in defining the infrastructure necessary to enable community science with petabytes of data. Cross-disciplinary opportunities with data and computer science, increased diversity in STEM, as well as ways for members of the community to get involved were also highlighted during Dr. Willman’s spectacular talk. 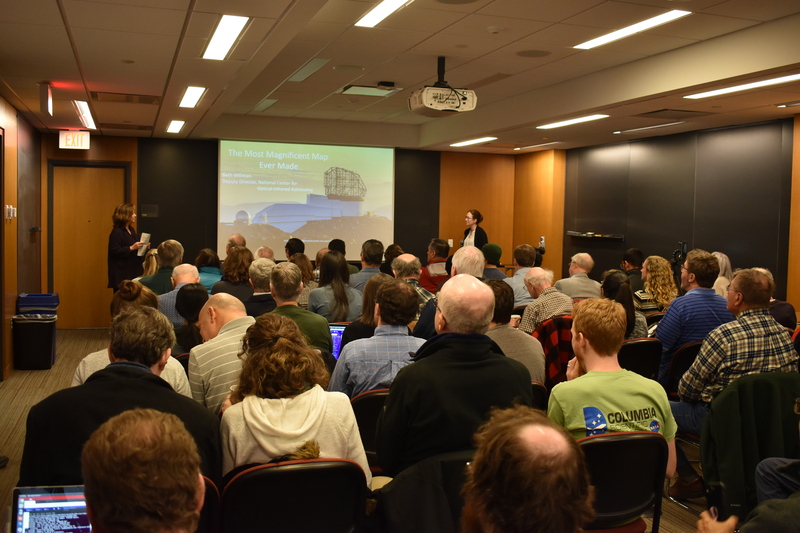 Interdisciplinary Colloquia is a series that occurs several times per year hosted by CIERA where prominent researchers give talks connecting astronomy to other disciplines.